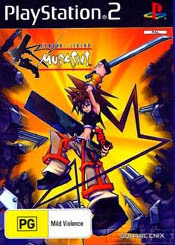 Musashi: Samurai Legend once again transforms gamers into the brave swordsmen Musashi who is once again called duty when a troubled village summons our hero to save them from a nefarious evil called the Gandrake Corporation. Not only must Musashi save their village but he must also rescue Princess Mycella and also find the pieces of the five legendary swords that contains earth, water, fire, wind and voice. The game itself is extremely reminiscent of the Final Fantasy series and with all good Japanese RPG titles, the hero starts with a katana and a ship oar. As you progress through the title, you slowly become more and more powerful until you are finally ready to take on the Gandrake Corporation. The control system of Musashi: Samurai Legend is rather easy to master and the character itself can perform a variety of manoeuvres that include jump, block, attack and also lock on. As you progress through the game, your character also learns special manoeuvres that can be released once your metre is filled. Although battles make up the majority of the gameplay, Mushahi must also compete a variety of different mini-quests such as flying around like the Rocketeer or performing for a circus troupe under his stage name of Musashi the Entertainer. All these mini-games help assist in breakup the repetitiveness of the game and actually assists in the longevity and playability of the title. 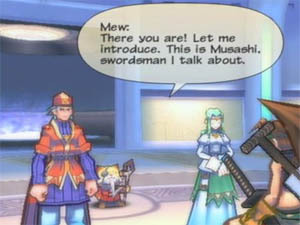 Graphically, Musashi: Samurai Legend is a strange looking game on the PlayStation 2 that looks like a Magna cartoon meets cell-shading that actually looks quite impressive. Match that with a variety of special effects such as anti-aliasing, lighting and shadow effects and you have a graphically adept title. All the characters have been professionally designed that contain some awesome texture details and realistic movements. Musically, Musashi: Samurai Legend features a rather Japanese sounding soundtrack, not on the scale of Final Fantasy but more on the rock n roll theme that ironically suits the RPG genre perfectly. Everything from electric guitars to violins have all been included in this soundtrack. 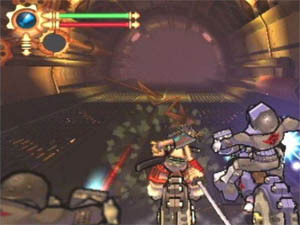 The game also contains a variety sound effects from battles, spells and the characters that make up the Musashi universe. The voice acting of the title is unfortunately a little dull with some of the voice acting suiting the characters perfectly, with others... well, let's just say you wouldn't be surprised to find them in a SEGA game like House of the Dead. In conclusion, the average gamer should complete this title in around 15 hours and will probably play the title until 1 or 2 times to find more secrets, weapons and equipment. It features a rather clichéd Japanese storyline, a sturdy gaming engine and enough longevity to keep gamers who love Final Fantasy type RPGs entertained until the next FF game is released.